There is always some preparation and planning needed to get ready. I suggest sending for a copy of my “Dollhouse Wiring” booklet for help in organizing procedures in building the dollhouse so it is ready for wiring. Building a foundation is recommended. Provide a “basement” space to mount circuit boards, remote control boards, or just to have a space to collect wire runs. It also makes it easier to repair future problems if most of your connections are in this space. Frame the base of the dollhouse with 1” x 2” pine boards and possible run one or two center cross-supports too. The second recommendation is to paint (prime) all of the wood of the dollhouse, inside and out, with a good primer such as Bin or white shellac. Do not use the all-in-one primer/paint products. Priming is always recommended before wallpapering but is helpful in gluing flooring down, or in getting the runs of flat tapewire to stick. My third suggestion is to plan on adding molding pieces on all of the ends of the floors and walls of the open side of the dollhouse. Use 1/16” x ½” wood strips. These will give you a 1/8” space for LED strips to be hidden and to provide indirect lighting to all the rooms. I usually route a channel (a chase) down the vertical wall ends where wires can be hidden and run to the basement for connection. These will all be covered later with the 1/16” strips of wood. When do I add the electrical wiring? Read “What do I do first”. Make sure all the construction is complete for each room. Paint all your ceilings. If possible, hold off on adding the roofing (shingles) or outside fascia and wait to install the stairways. Do install windows but you may want to wait on gluing in the doors. Also wait on installing flooring, any wall coverings, wainscoting or base and crown moldings. After you have run your flat tapewire and provided a point of connection for all of the ceiling lights, fans, sconces, you can lay the flooring, glue in the doorways, and install the stairs. It is not too late to add electricity if you have already completed total assemble. You just have to be a little more creative in how the wires get from point A to point B and you will find using the Kynar hook-up wire becomes easier to use than the flat tapewire. As I mention in my booklet: “Learning how to electrify your dollhouse is not the problem—it is how to run and conceal all the wires”. Can I use my old transformer? Yes, if it is already installed and everything is working: Leave it alone. If you are starting a new project or repairing and fixing an existing project; I highly recommend buying a new 12 volt DC power supply and throw away the transformer. LEDs and all the latest electronics work best on DC. All of the incandescent lights will work better and last longer on DC. Even if you purchase a new LED (Christmas Light String as an example) and it says it will work on AC or DC it will work best and last longer on a new DC power supply. Can LEDs and incandescent lights work together? Not a problem. All of your incandescent lights or florettes from pea bulbs to flame-tip bulbs to bi-pin bulbs will work with LEDs. Although LEDs do not work well with AC, when you switch to DC, they work equally well alongside any of the incandescent bulbs. In fact, in switching to DC all of the incandescent bulbs will work even better. Today’s technology makes selecting your power source much easier than in the past. Purchase a new 12 volt DC power supply. Come up with an approximation for the number of light bulbs and special features you plan to have in your project. Count the number of light bulbs rather than number of lights. If the chandelier has six light bulbs it counts as six not one. Consider three LEDs equal to one bulb. Each of my power supplies estimate the maximum number of lights it can illuminate: One amp (12 watt) will accommodate 26 light bulbs; two amp (24 watt) will accommodate 52 light bulbs; six amp (72 watt) will accommodate 155 light bulbs. You cannot go wrong by purchasing too large of a power supply as it will work just as well lighting one light bulb as in lighting its maximum number. For most projects the 2 amp power supply would be my choice. 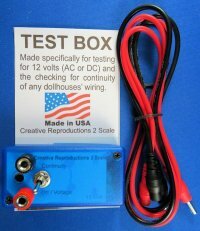 If you have a very large dollhouse purchase the 6 amp and if all you are wiring is a room box, the 1 amp is plenty. Round wire or flat tapewire? You can easily find people that prefer one over the other. My feeling is that both are about the same. At least in comparing flat tapewire to my Kynar hook-up wire. Both are capable of carrying 6 amps of current. Both are capable of handling the electrical demands of a 6 amp power supply. Flat tapewire is easier to layout, keep in place and conceal under flooring or wallpaper. Round wire is easier to work with in a fully finished dollhouse where you need to run connections behind moldings or down routed runs or chases. The problem is in making connections or at junction points. I use both flat tapewire and round wire and have equal success with each. The common solution to working with either form is to solder all of your connections. Never use those small brads to complete a connection with the flat tape. Do I really need to learn how to solder? No, but I strongly recommend learning how to solder to achieve the best and longest lasting results of your wiring. 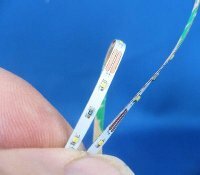 I have a full chapter on soldering in my “Dollhouse Wiring” booklet and it gives a number of alternatives to soldering.